There is nothing worse then knowing you printed a coupon and can not find it. Or actually there is something worse…finding the coupon AFTER the sale is over! Yep, I’ve been there. You know the drill…A coupon pops up for an item that you love but there is no sale. You print it in the hopes of a sale popping up before the coupon expires. The question is, what do you do with them all so you don’t wind up with a mounds of printable coupons? Here are some tips to help you keep the coupon clutter under control. Of course, if you have a coupon binder, you can just print, clip and stick them into your binder. But, if you are like me and keep your inserts organized whole in a file, well then, where do you put those printable coupons? Here are some ways to help you organize them. Keep a hanging folder just for printable coupons. You can even have separate hanging folders for different categories or organized by expiration date. Pick up some portfolio folders from the Dollar Store. Get the ones with holes and place them into a 3 ring binder. Again, you can separate them by category or expiration date. You could also get plastic photo holders and place them in a binder just for your printables. Use stackable mini draws to clip and store your printable coupons. This can even be used for all those loose coupons you get from tearpads, blinkies or even the coupons you clipped and wound up not using. Believe it or not, getting my coupons together for my shopping trips was my hardest problem. Since we find out so many deals in advance, I would print coupons knowing that a deal was coming up but, by the time the deal came, I could not find the coupon. Or, I would be clipping a coupon out of my inserts and see another one that I knew I would use next week on a deal. Only to find the coupon buried under a pile of paper a week after the sale ended. So hate that! My solution was so simple. Since I am a very visual person, I need to be able to see my “piles” of coupons. 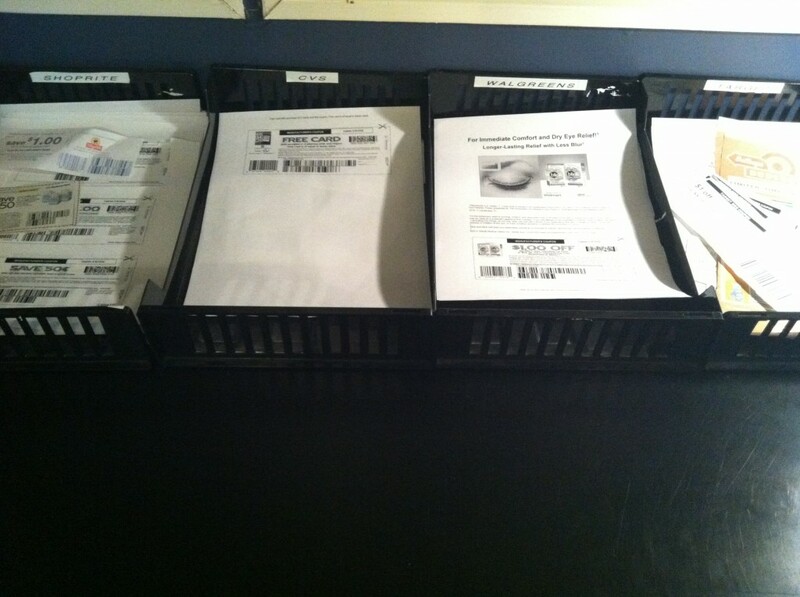 Using stackable trays, I set them side by side and labeled them with the stores that I frequent. In them I place, catalina coupons, ECBs or Register Rewards in the appropriate bin. And, when I print or clip a coupon that I will be using at that store, I just throw it in the bin. When it’s time to prepare my shopping trip, more then half of my coupons are already there waiting for me. No more finding coupons after the sale is over! 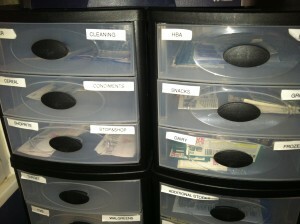 Now it’s your turn…How do you organize your printable coupons?